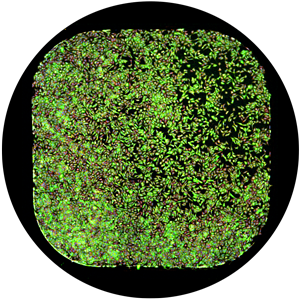 Unstimulated transfluor-expressing cells wtih cytosolic distribution of beta arrestin GFP. Nuclei stained in blue, mitochondria in red. Stimulated transfluor-expressing cells with beta-arrestin GFP that has redistributed to vesicles. Nuclei stained in blue, Mitochondria in red. Visit the MetaXpress Software Application Modules to learn more about analysis for cell health, cell cycle, micronuclei, neurite outgrowth, angiogenesis, translocation, multi-wavelength cell scoring and granularity. 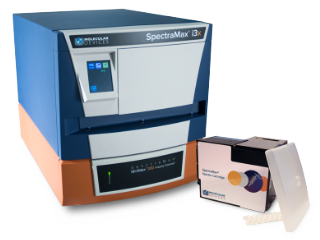 Measure critical events including apoptosis, cell cycle, micronuclei, neurite outgrowth, angiogenesis, intracellular translocation, endocytosis, cell signaling, and multi-wavelength cell scoring. Images of control cells showing DNA damage detected by H2AX phosphorylation. The positive control (bottom) clearly shows a higher percentage of cells with DNA damage (green) compared to total cells (red) in the well. Visit the MetaXpress Software Application Modules to learn more about analysis for neurite outgrowth, translocation, cell scoring and multi wavelength cell scoring. Watch a 30-hour time-course movie of increasing apoptotic and dead HeLa cells after treatment with 100 µm Etoposide. Blue = Hoechst for all nuclei; Red = Propidium Iodide for dead cells; Green = Nucview488, a fluorescence substrate for Caspase 3 and an apoptosis sensor. Overlaid on a phase contrast image..
Neuronal processes can be measured and quantified with a Neurite Outgrowth Application Module in MetaXpress Software. 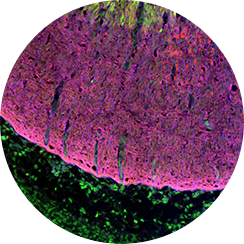 Visit the MetaXpress Software Application Modules to learn more about analysis for neurite outgrowth and angiogenesis application modules. Click here to learn more about MetaXpress Application Modules that enable some common HCS assays. 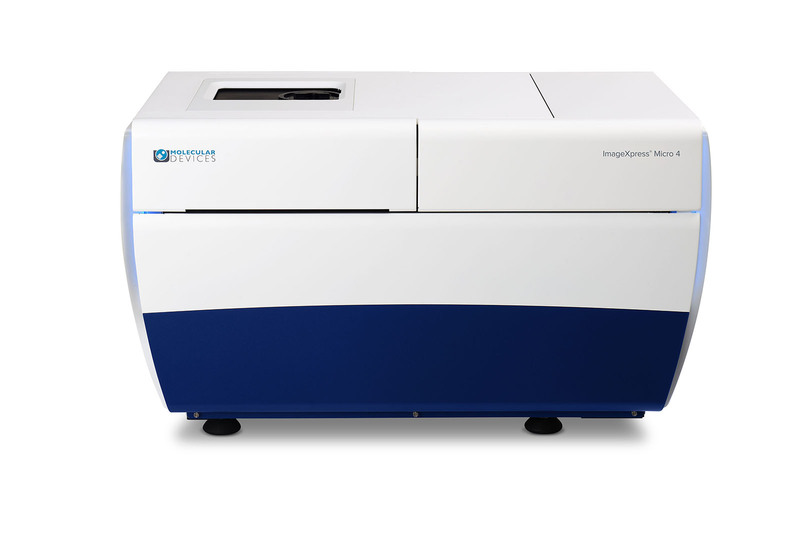 Molecular Devices brings the image acquisition and analysis for ImageXpress systems under one common platform to streamline workflow, offering a truly end-to-end solution for high-content screening. MetaXpress Software Custom Modules: flexible toolbox for advanced assays, including 3D structure analysis with volume, intensity, and distance measurements. AcuityXpress™ High-Content Informatics Software further analyzes, visualizes, and mines data. MetaXpress® PowerCore™ High-Content Distributed Image Analysis Software dramatically accelerates analysis speed in a high-throughput environment. MDCStore™ Data Management Solution provides users with a validated solution to securely access, manage, and depoly a high-content analysis environment. 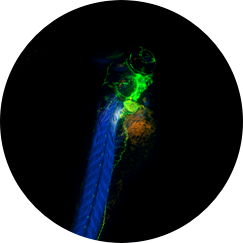 The ImageXpress Micro 4 High-Content Imaging System offers researchers an agile imaging platform with field upgradeable confocal imaging. 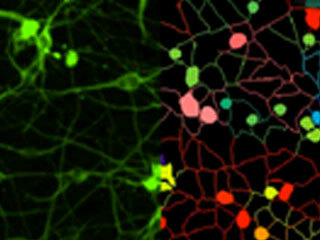 For more details on the confocal system, please click here. 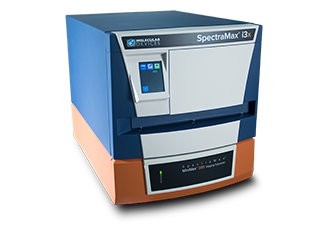 Additionally users can configure the instrument to fit their specific research. For more information on product configurations and pricing, please click here. Broad spectrum long-life light source is suitable for most fluorescent applications, 10 position filter wheel included for ratio imaging (Fura-2; BCECF). Compatible with multi-pass excitation cubes for additional flexibility and speed. Optional upgrade for ImageXpress Micro 4 system. 10 position excitation filter wheel increases the number of preconfigured filters installed with systems to support multi-pass dichroic and emission filters in core facilities with a large variety of fluorophores in use. Fast filter exchange is ideal for exciting ratiometric indicators (e.g. Fura-2; BCECF) to monitor fast cellular responses and real-time kinetics indicative of ion exchange and intracellular signaling. Configurable solid state light engine is a customizable excitation source with independent control of up to 7 wavelengths. It expands flexibility of wavelength selection and is compatible with multi-pass excitation cubes for additional throughput and speed. 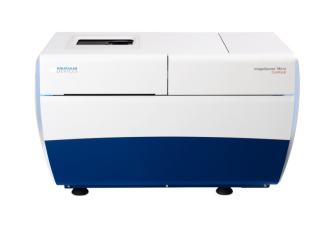 The ImageXpress Micro 4 High-Content Imaging System enables contrast imaging of unstained samples to monitor cells that may be overly sensitive to the effects of fluorescent labels or need to be monitored over time without intervention. The Phase Contrast option can be used to scrutinize cell quality before and after biochemical assays, or combined with fluorescent applications and environmental control to examine multiple parameters at once. The Environmental Control Option for the ImageXpress Micro 4 High-Content Imaging System can be configured to mimic conditions within a laboratory incubator (temperature control, gas mixture and humidity) to keep cells alive for long periods of time, making high-content screening kinetic and time lapse experiments a reality. User-defined premixed air allows researchers to select atmospheric conditions most appropriate for their cell type (e.g. 5% or 10% CO2). Temperature control of the sample plate helps maintain physiological environment. Humidity regulation is maintained above sample plate to minimize evaporation of media and extend measurement time. Our high resolution stage and environmental control enable fast kinetic imaging of live cells or long time lapse monitoring of each well in a plate for hours or days. During assay development, the Fluidics option facilitates compound addition and cell washing to characterize potency or to determine incubation times for higher throughput fixed time point assays. Variety of Nikon 1x- 100x air and oil immersion lenses are supported. Additional filters as well as custom configurations are available upon request. Filter specifications are current as of 9/1/2015. Though the technical specifications of the ImageXpress Micro 4 system are different than that of our legacy ImageXpress system products, the widefield mode covers the same applications as the legacy widefield only products.